It has been longer than I wanted since I wrote my last recently read and I blame one of the books I have read. I was going to wait till I'd read another book to add to this post but I decided to do a full review(and giveaway!) in a week or so and so I thought I would just include three books this time. Let me know if you like more or less books included in each post! The True History Of The Kelly Gang by Peter Carey. This is the second book I've had to read for English after In Cold Blood and my opinion can not be more different as I really didn't like this book. It's definitely not for my age group I feel and the book was a real chore to read. I found it hard to understand the whole story with the narrator being Ned Kelly, a member of the Kelly family who had a poor education so only uses the grammar of full stops and question marks. I think I might of been able to cope with this if it wasn't for the amount of speech throughout that, without speech marks, was very hard to tell when something was spoken or not. The book was about an Irish family who had emigrated to Australia and they received bad education and were always in trouble with the police. They turned into a group of Robin Hood style criminals who would steal from the rich and give to the poor. To me, this was the worst book I've read in my spare time and as a college/school set text and I wouldn't recommend to any young girl because it was just boring. Maybe if you're interested in Australian history? Because of this book, it was a slow start for reading this month so I needed some easy reads to follow. 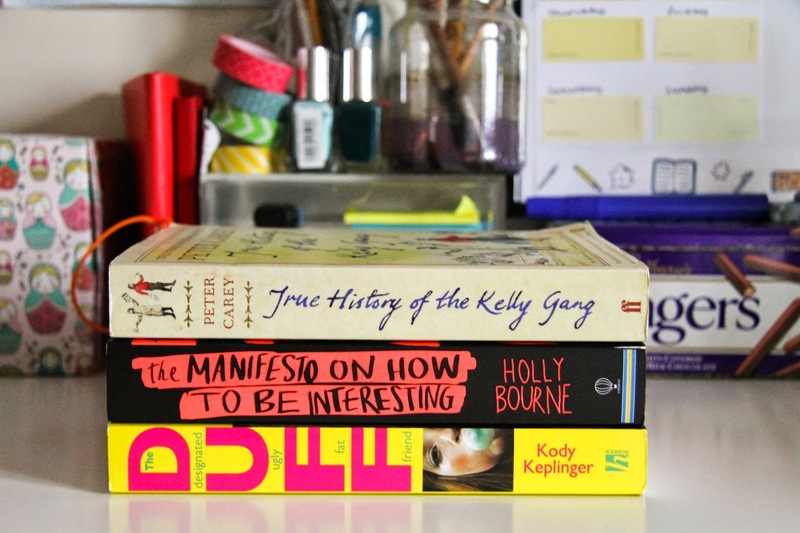 The Manifesto On How To Be Interesting by Holly Bourne. I actually read this book before the Kelly Gang and I enjoyed it. It's about a girl named Bree who isn't noticed around school unless the mean girls were calling her names. She's a keen writer and, after being turned down by all publishers, Bree thinks she should make her life more interesting to inspire her writing. She sets up a blog where she can write own her thoughts during her project to become interesting. When first reading the book, right from the start I couldn't stand Bree and I hated to hate her because, you find out very early on, that she self-harms. This is a problem I have with a lot of books who cover the topic of self-harm and suicide etc. I hated the way that he was becoming a bully herself However, I was happy to find that I did start to like her right at the end and it's the first book that's bought a tear to my eye in a while. Being based on English school I could really relate to it and each of the characters I could think of an equivalent to someone at my own school. I think this is one to read if you're in your final years of high school and it reflects how school life is right now. It is a very cliche YA novel but it had something more to it that I loved and I do recommend it. The Duff by Kody Keplinger. From one fairly Cliche YA novel to another. After seeing all the trailers to the film adaptation that's just been released in America, I really wanted to read the book. The main character is Bianca who know's she's not the prettiest but when Hamilton High's Jock Womanizer Wesley refers to her as the DUFF (Designated Ugly Fat Friend), she becomes very insecure. Paired with problems going on at home, she finds her self finding relief in a way she would have never expected. Here I've given a brief summary that gives less spoilers away from the blurb of the book as read the blurb and you might feel there's no need to read the book because it gives so much away! I could tell straight away where the story was going to go but that didn't stop me enjoying it. I couldn't connect and relate to it as much as othr books such as the book mentioned above but I still really enjoyed it. It's definitely one I'd recommend to friends who love the YA romance genre and love a good cliche story. From the trailers I've seen of the film, it's completely different from the book but I think I'm going to love it. I feel like this a quick Recently Read this time. I never know how many books to include so let me know if you'd like more books in each post or if you would like to see more individual book reviews. What've you read recently? Any Recommendations?